The Transplant Center at University of Colorado Hospital is the only transplant program in the Rocky Mountain region that performs all solid organ transplants. Located in metro Denver, the transplant program has performed more transplants than any other hospital in Colorado. Transplant patients who come to University of Colorado Hospital are often very, very sick. Their survival depends on well-orchestrated care delivered by our highly-skilled, interdisciplinary transplant team. For almost two decades, the University of Colorado Hospital’s Multi-Organ Transplant Program has been performing heart, heart/lung, lung, kidney, kidney/pancreas, and liver transplants to save lives. Today, the program is one of the only programs of its kind in the Rocky Mountain region. Our team is known internationally for providing the finest transplant care. 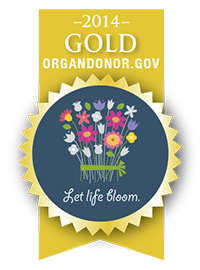 University of Colorado Hospital is among a select group of hospitals nationwide recognized by the U.S. Department of Health and Human Services (HHS) for reaching the top level of achievement in conducting activities that promote enrollment in state organ donor registries.